The 26.5 metre motor yacht La Felicita, listed for sale by Michael Newton-Woof at Ventura UK, has been sold in an in-house deal. Built in GRP by Italian yard Ferretti, she was delivered in 2015 as a Ferretti 870 model. Inspired by the styling of the Ferretti 800, the Ferretti 870 is another cooperation between Studio Zuccon International Project and the Ferretti Group. This particular model has over €500,000 in extra options and is so highly specified that the Ferretti Group displayed her at the 2015 Cannes boat show. Accommodation is for eight guests in four cabins consisting of a master suite, two VIP suites and a twin, all with entertainment centres, LCD television screens and en suite bathroom facilities. An interior in walnut stained oak has an open plan saloon with the lounge area offering freestanding white settees and armchairs while the dining area has seating for eight guests. Out on the massive aft deck there is outdoor entertaining and dining available at a teak table and matching teak chairs while the flybridge entices with a fully fitted wet bar, fridge and electric grill. There is also ample seating, a table, sun pads and a hard top. On the main deck, living and dining areas, galley and helm station have been effectively separated: the latter two, extensively modified, are located at the bow, completely divided from the rest. This means that crew can go about their tasks without disturbing guests. 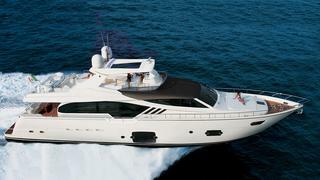 Twin 1,984hp MTU engines give her a cruising speed of 27 knots, topping out at 30.5 knots. Lying in Corsica, La Felicita was asking €4.3 million.